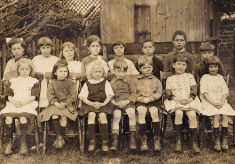 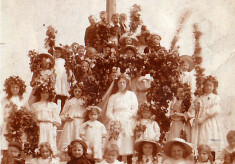 Five old pictures contributed by Sheila Jones, showing the children of the Sharpe family, Mr Challands, Mr James North, the May Queen and the village school. 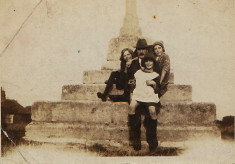 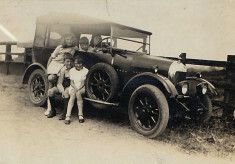 Iris, Irene and Phyllis Sharpe, and Mr Challands, on the steps of Muston village cross, c.1923. 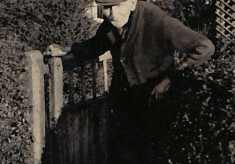 Mr James North at his garden gate by Holly Cottage, the Green, Muston, probably in the 1920s.